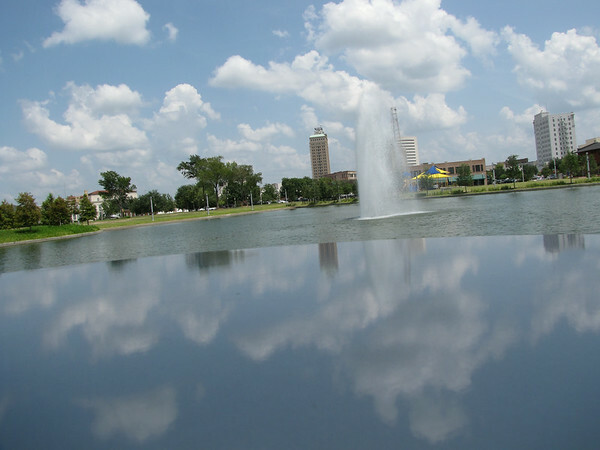 In an attempt to revive downtown Beaumont, there is now a very large and impressive skate board area, an immense playground built under the auspices of Rotary, and an Event Centre by a largish pond with a fountain rather reminiscent of sewage water purification. On Mondays, there is now an event called Lunch on the Lake. The Event Center broadcasts music, several food trucks show up and people are invited to bring their lunch or buy it and converse with one another at the tables set out underneath the awning. I had long thought about attending but this week I was not working on Monday and made my way there after stopping at the Motor Vehicle Department for tags and the post office to send out some postcards. Two trucks–Jamaican Cajun and Charlies Barbecue were there along with a snow-cone truck which was surprisingly not well attended despite the 100 plus temperature. There was a scattering of people and I was happy to take refuge under the awning-canopy. I watched one person walk around the lake; there are benches located on all sides of the center; a lot of parking and a lot of green space. The music came from a canned source; I would have preferred a more personal choice. On Thursday, there will be Jazz–hopefully it will be Dixie.